“Widower Bluebeard and the Red Key” – a painting from Cassia Lupo’s wonderful series “Fables and myths.” Reproduced with permission and grateful thanks. For very nearly all its course, the Blavet is a placid river. It winds its way through central Brittany: broad, unhurried, gentle and unthreatening, a favourite among fishermen, and – for the century or so since it was dammed at Guerlédan, creating a substantial lake – a magnet for holidaymakers, too. Yet even there, at the heart of an ancient county that knows its history as well as anywhere in France, not one person in a thousand could tell the awful history of the river. Few realise that there were times when it was not so tame, or can point to where the outlines of an ancient fortress can yet be traced, up on the heights above the dam. And almost nobody recalls the lord of that forgotten castle, or could tell you why, until about 150 years ago, Breton peasants crossed themselves at the mere mention of his name. His name was Conomor the Cursed, and he lived in the darkest of the Dark Ages – in the first half of the 6th century, 150 years or more after the fall of Rome, when much of Brittany was still dotted with dolmens and covered by primeval forest, when warlords squabbled with one another other over patrimonies that were generally less than 40 miles across, and the local peoples were as likely to be pagan as they were Christian. We know almost nothing about him, save that he was probably a Briton, very probably a tyrant, and that his deeds were remembered long enough to give rise to a folkloric tradition of great strength – one that endured for almost 1,500 years. But the folk-tales hint at someone quite extraordinary. In local lore, Conomor not only continued to roam the vast forest of Quénécan, south of his castle, as a bisclaveret – a werewolf – and served as a spectral ferryman on another Breton river, making off with Christian souls; he was also the model for Bluebeard, the monstrous villain of Charles Perrault’s famous fairy tales. 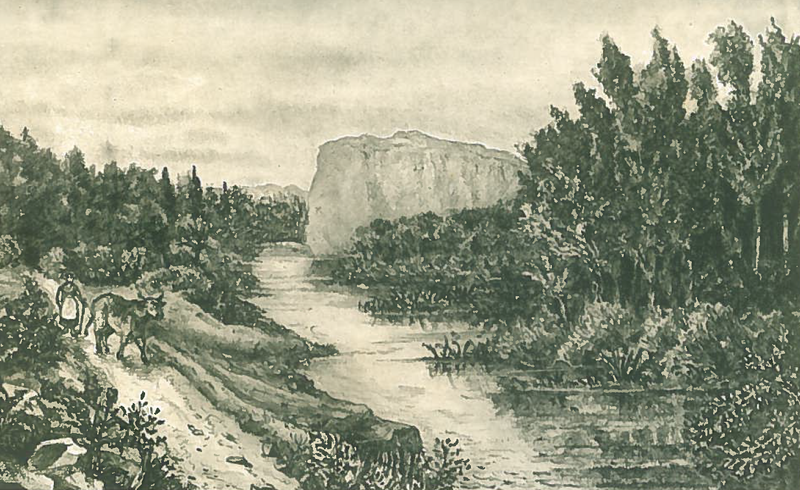 A 19th century sketch of the Blavet at the spot where Conomor’s fortress, Castel Finans, once loomed over the river. Today, thanks to the construction of a dam, the water level is vastly higher, obscuring the great defensive qualities of the position. Bluebeard himself, of course, has fallen through the cracks of our collective memory. His tale is seldom told these days; it is far too bloody to sit comfortably alongside the Disneyfied versions of Perrault’s more celebrated stories – his single volume, known familiarly to English-speaking readers as the Tales of Mother Goose, also introduced the world to Sleeping Beauty, Cinderella, Puss in Boots and Little Red Riding Hood. That’s because, while he bowdlerised his other tales, all told originally by adults for adults (Perrault ignored – to give just one example – an older version of Little Red Riding Hood in which the child performs a striptease for the lecherous wolf), the account he span of Bluebeard reads like a treatment for a modern horror movie. 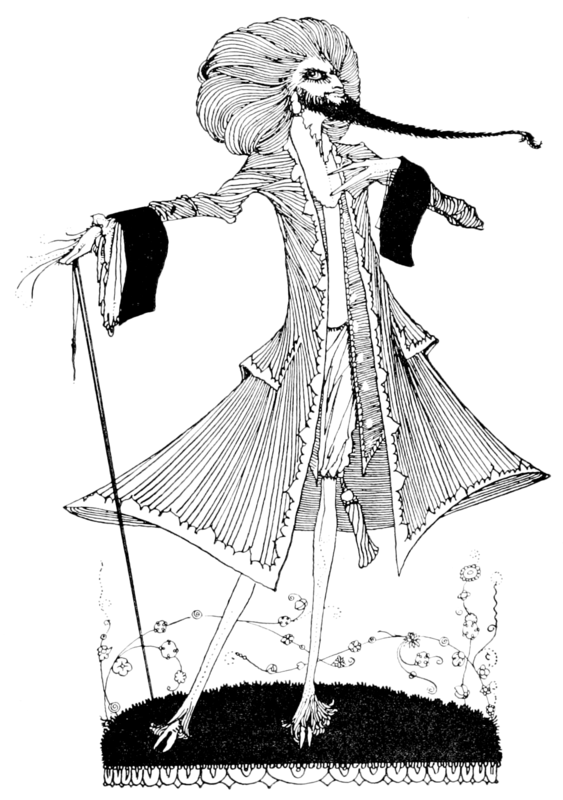 Harry Clarke’s imagining of Bluebeard, drawn for an early 20th century edition of Perrault’s tales. Bluebeard departs and, naturally enough, his bride is so consumed with curiosity that she rushes straight to the forbidden room, almost falling downstairs and breaking her neck in her haste. Pausing only for a second to recall the promise that she made to her husband, she thrusts the small key into the lock, turns it, opens the door – and finds herself confronted by a terrible scene. The floor is thick with clotted blood, and the decapitated bodies of Bluebeard’s former wives hang from the walls. Each has had her throat slit, and – in several versions of the tale – much of the blood that they have shed has been collected in an enormous basin that squats monstrously in the centre of the room. The young wife is so horrified by this sight that she drops the key to the slaughter chamber into the pool of blood lapping at her feet. Hurriedly, she bends to pick it up – only to find that the bloodstains on it cannot be removed. No matter how hard she buffs and scrubs it, the blood that coats the key returns, first on one side, then the other. It is readily apparent to the reader that it must be charmed, and, indeed, as soon as Bluebeard returns from his business trip and calls for his wife, he recognises the significance of the reddened key. Knowing that his bride has ignored his orders (though, as Maria Tatar points out, he surely wanted her to disobey), he tells her that she has sealed her fate, and will be the next victim of the locked room. The legend of Bluebeard is still sometimes retold – here, in a 1970s film, in a version in which Bluebeard is a disfigured World War I German fighter pilot (Richard Burton at his fruitiest), and one unlucky wife is played, somewhat implausibly, by Raquel Welch. Bluebeard’s wife pleads earnestly for mercy, but her husband will not yield, and the one concession she can wring from him is permission to go and dress herself in preparation for her execution. In several versions of the story, she ascends to her bedchamber in order, so she says, to don the gown that she was married in. In fact, though, this is simply a ruse. Her brothers have promised to come and visit her, and she sends her sister to the highest tower to watch for signs of their arrival. It is here that Perrault ratchets up the suspense. Twice the trembling bride calls up to ‘Sister Anne’ (the one person in the story who is actually named) to ask if her brothers are in sight; twice she receives the answer that “all I see are the flurries of the sun, and the grass turning green.” All this time, Bluebeard is standing at the foot of the stairs, shouting up for her in ever angrier and more urgent tones, while his wife calls down with ever-flimsier excuses. At last she can delay no longer, but at this crucial moment the clouds of dust thrown up by her brother’s galloping horses can be seen at last, and just as Bluebeard drags her to the execution-place, the door bursts open, the brothers appear, and the monster flees, only to be cut down by their swords. In the denouement, Bluebeard’s wife uses his riches to affiance her sister to a man she loves, find herself a second husband, and buy her brothers commissions as officers in the king’s army. There is no further mention of her slaughtered predecessors, nor of the anguish that her discoveries must have caused their families. Many scholars have searched for Perrault’s sources. 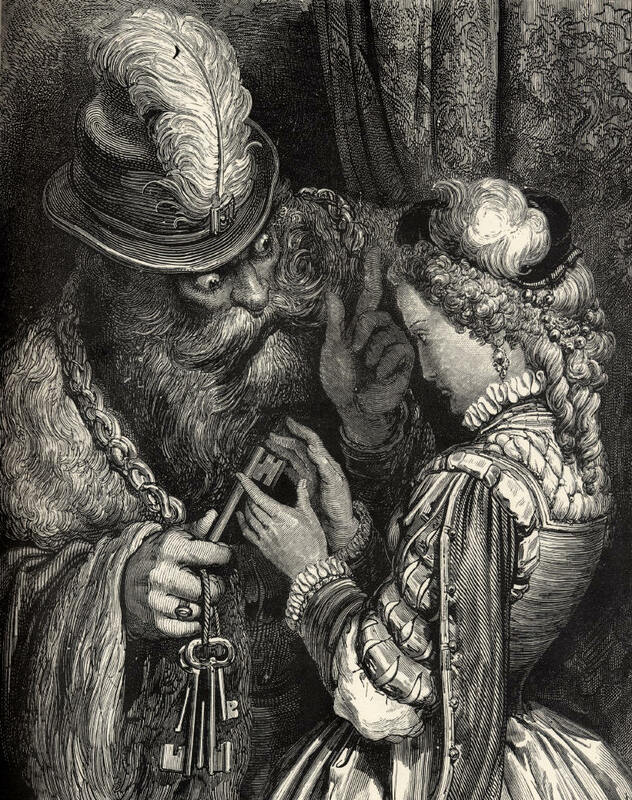 It seems to be a fact that the story of Bluebeard appeared nowhere in print before the Frenchman published it in 1697, but the accumulated research of generations of critics and folklorists has shown that, while myriad versions of the tale existed among the oral traditions of most parts of France – and there are equivalents in many other countries, in every one of which the Bluebird-figure is portrayed as the cruellest monster ever to walk the earth – the largest number come from Brittany, and the historic figures most closely associated with the Bluebeard myth are Bretons, too. They are Gilles de Rais, the notorious libertine and boy-murderer who befriended Joan of Arc, and Conomor the Cursed. Scene from a late 19th century novelty tableau. The heads of Bluebeard’s murdered wives hang behind a curtain, ready to be revealed to a horrified audience. 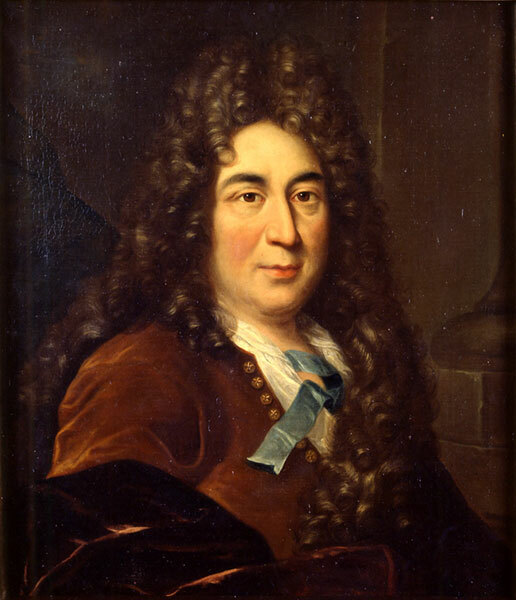 Charles Perrault, author of the Mother Goose tales, was a high official in the France of Louis XIV who turned to fairy tales only after his career was abruptly ended by association with political scandal. The Conomor of legend was ruler of the northern Breton coast, with his main seat at Carhaix. It seems that he was also some or all of the Comorre, Conomorus, Kynwawr, Cunmar, Chonomor, Choonbro, Chonobor, Commorus, Chonomorem, Cvnomoriv and Choonober who feature in the chronicles and monuments of the time (the name has been Latinised, rendered from Franconian into French, hastily copied, confused with that of other rulers, or left in its native Old Brythonic, but it always means something along the lines of “Hound of the Sea”). He appears with considerable frequency in a cluster of Breton saints’ lives written some time during the ninth century, supplying the necessary villainy to stories of the holiness of St Paul Aurelian, St Samson and St Gildas. The most elaborate versions of his legend do dwell briefly on the manner in which he came to power – by overthrowing and killing his predecessor, Jonas, and driving Jonas’s son, Judwal, into the arms of the neighbouring Franks – and on his unpleasant character; according to the Breton author Emile Souvestre, “he was a giant, one of the wickedest of men, held in awe by everyone for his cruelty. As a boy, when he went out, his mother used to ring a bell to warn people of his approach. When unsuccessful in the chase he would set his dogs on the peasants to tear them to pieces.” For the most part, however, they revolve around consequences of his marriage to a Breton girl, Tryphine or Tréphine, the beautiful daughter of Waroch (or Guérok), Count of Vannes. It is in these saints’ lives that we encounter the Conomor who most resembles Bluebeard. He was – Albert Le Grand avers – a tyrant who had already murdered four wives when his eye fell on the beautiful Tryphine. Being known throughout all Brittany for his cruelty and vices, Conomor could not persuade the girl and her father to assent to a marriage. Instead, he resorted to a cunning stratagem. At a time when Brittany had long been wracked by fighting between rival petty rulers, who between them had brought misery to the peninsula, he offered Waroch peace in exchange for Tryphine’s hand. Tryphine’s son by Conomor, Trémeur, is said in some version of the monster’s legend to have been murdered by his father to prevent fulfilment of a prophecy. Statue from the chapel of St Trémeur, near Carhaix in Brittany – the small town at the centre of the legend of Conomor the Cursed. For a short time – the same saints’ lives continue – all was well, and Conomor made a concerted effort to be charming to Tryphine. But then something happened to change matters for the worse. There are two traditions here; in one, Conomor is entrapped by another girl at court, who is able to make him fall for her by taking a tumble from her horse in such a way that she inflames his passions with a display of shapely ankle; the count seeks to free himself to pursue her by disposing of Tryphine. In the other, Conomor’s new bride finds herself pregnant, and hence incurs the wrath of a husband who believes their child will grow to kill him. descended into the chapel to pray, [but] when she rose to depart, the hour of midnight struck, and suddenly a sound of movement in the silent chapel chilled her to the heart. Shrinking into the recess, she saw four tombs of Conomor’s wives open slowly, and the women all issued forth in their winding sheets. “What hope then of refuge remains for me?” cried Tryphine. “Go back to your father,” answered the phantoms. “By means of this cord with which he strangled me,” answered the second wife. “The fire that burnt me,” replied the third wife. “And how can I make so long as journey?” returned Tryphine. “Take this stick which broke my skull,” rejoined the fourth spectre. Armed with the poison, the rope, and the stick,Tryphine set out, silenced the dog, scaled the wall, and miraculously guided on her way through the darkness by a glowing light, proceeded on her road to Vannes. 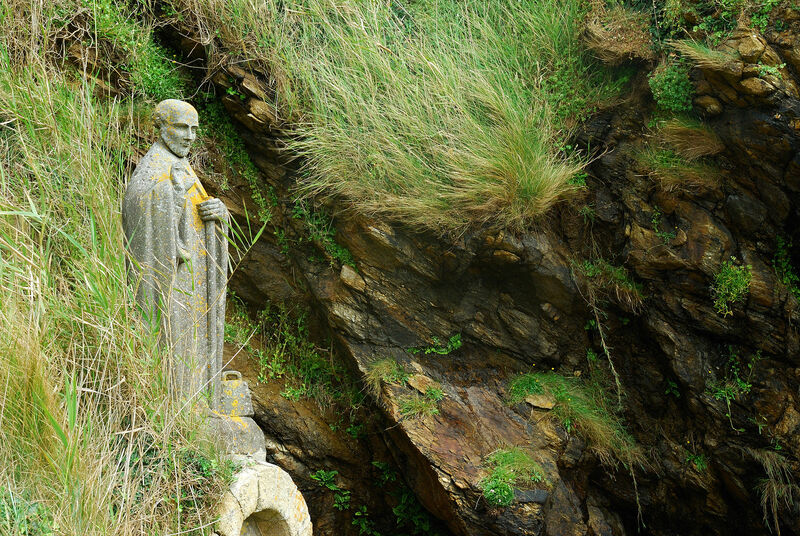 A statue of St Gildas at the spot where he is said to have established his hermitage, in the woods outside the Breton village now known as Saint-Gildas-de-Rhuys. Unfortunately for the girl, she was making her escape on the only horse available, a haquenée (“an ambling nag”). She did not get very far before an enraged Conomor overtook her, dragged her out of the thicket where she had vainly sought to hide herself, and, ignoring her tearful pleas for mercy, lopped her head from her body with one stroke of his sword. approached the body, and, taking the head, placed it on the neck; and then, speaking to the defunct, he said to her aloud: “Tryphine, in the name of Almighty God, Father, Son and Holy Ghost, I command thee to rise upon thy feet, and tell me where thou hast been.” The lady rose, and before all the assembled people, she said that the angels had been preparing to place her in Paradise, among the saints, when the words of St Gildas had called her soul back to earth. There is, of course, a postscript to the legend: having resurrected Tryphine, Gildas travelled along the banks of the Blavet to where Conomor’s fortress, Castel Finans, loomed on a rocky promentory above the river. The count had the castle gates closed as he approached, but the saint merely knelt, picked up a handful of dust, and flung it against the walls – which promptly crumbled just like those of Jericho. In at least some versions of the legend, Conomor himself survived this disaster to retreat to a second stronghold, but there, in solemn conclave, Gildas led the 30 bishops of Brittany in anathematising him, whereupon the tyrant was immediately seized by a “terrible malady,” and his soul born off bobbing on “a stream of blood.” But a potent Breton legend asserted that Conomor’s evil was such that he was denied entry to both Heaven and to Purgatory, and instead remained on earth to haunt the dark, rock-strewn interiors of the ancient forest of Quénécan in the form of a werewolf – one that devoured travellers who passed that way, and could be killed only by the thrust of a knife right through the centre of his forehead. 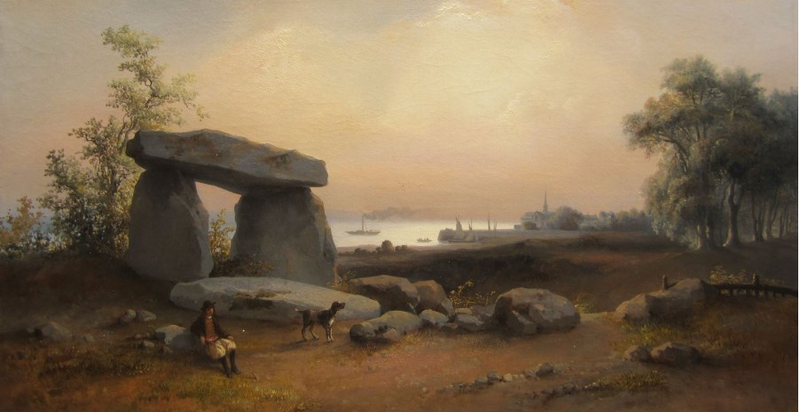 The ancient landscape of Brittany is filled with prehistoric monuments known as dolmen. This one is close to the Atlantic port of St Nazaire. Approaching all of this as an historian, rather than a story-teller, it is sensible to ask, first, what – if anything – such saints’ tales can tell us about what was really going on in Brittany in the sixth century. It should go without saying that the Lives from which these details have been lifted are notoriously suspect sources. Those that dwell on Conomor were not only composed three centuries after his death, in the ninth century; they were also written as hagiography, in conventional styles, and designed to convey morals and religious messages, not facts. We ought to be deeply suspicious of their contents; certainly it would be dangerous simply to discard their evidently legendary trappings, and hope thereby to recover a residue of solid history. The testimony of the saints’ lives, in short, requires corroboration – and to go back any further, and attempt to detect the relicts of an historical Count Conomor, means travelling well beyond the range of almost every chronicle. It means relying on just a handful of written sources, and some ambitious archaeology. Brittany in the 6th century, from the New Cambridge Medieval History. Conomor’s domain ran along the northern coast, corresponding roughly to Dumnonia. Waroch’s was in the south-east, around Vannes. We have no idea of the borders of their territories. Click to view in higher resolution. The chief problem confronting would-be historians of this period is that the Brittany that Conomor knew was a land at the periphery of almost everybody’s interests. Abandoned by the Romans after 380, the peninsula had been swept by successive waves of barbarians and colonisers for well over one hundred years; the Life of St Paul Aurelian mentions it as a “land of four languages,” suggesting that Latin (from Italy), Old Franconian (drawn from Germany’s North Sea coast), Brythonic (from Britain) and also Alan (originating in what is now Iran) were all spoken in these districts at this time. The Breton peninsula also lay beyond the borders of the burgeoning Frankish state, which in Conomor’s day already stretched from Aquitaine in south-eastern France all the way to Thuringia, abutting what is now the Czech Republic. As such, Breton history is mostly ignored in the one almost contemporary source we have, the Historia Francorum (History of the Franks) of Gregory of Tours, completed in 594. 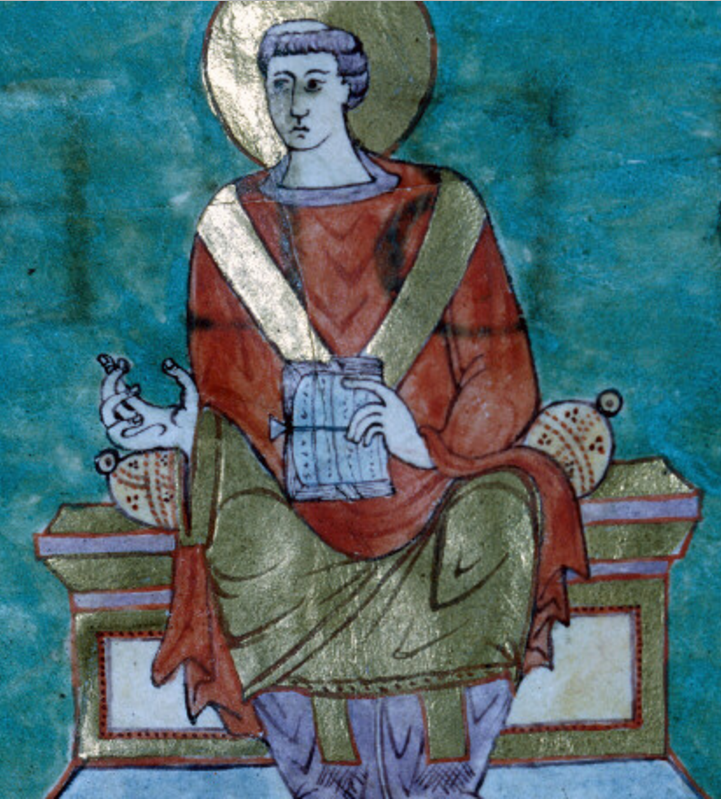 And, aside from Gregory, our sources for the period are limited to scraps – this despite the fact that one of the main protagonists of Conomor’s story, Gildas, was himself the author of another notable early work: a sermon, focused on the failings of the kings of Britain, which fails to make any mention whatsoever of Conomor. For now, the thing to remember is that the doings of the petty warlords who established toeholds in sixth century Brittany were noticed only when they interfered with the smooth running of the larger states to the east. All we really know, in consequence, is that – by around 550 – Brittany consisted of several rival polities, the largest of which was the one we now associate with Conomor: Dumnonia, along the northern coast. Warfare – at least in the form of raids and skirmishes – was more or less endemic in the district, not only between the various Breton counts but also between the Bretons and the Franks. By later standards, though, the causes of conflict were generally petty ones; the chronicles record attacks on Rennes and Nantes that were apparently mounted with the aim of seizing the grape harvest of the Loire valley and escaping back to Brittany with the wine. The Franks retaliated by seizing hostages and taking sureties from their fractious neighbours to the west. St Gregory of Tours, the sixth century chronicler who tells us most of what we know about the historical Conomor. There is a bigger story here – Judwal seems to have spent his years of exile at the Frankish court, and Gregory of Tours presents his struggle with Conomor as part of a wider conflict that took place in the late 550s between the much more powerful Frankish king Chlothar I (reigned 511-558) and Chlothar’s ambitious son Chramn. Since this civil war is both patchily chronicled and frankly confusing, there is not much to be gained from an attempt to contextualise. It is more interesting, and hopefully more profitable, to turn instead to the ways in which the history of Conomor the Cursed can illuminate the most puzzling and contested aspect of Breton history in this period: the nature of Brittany’s relationship with Britain. 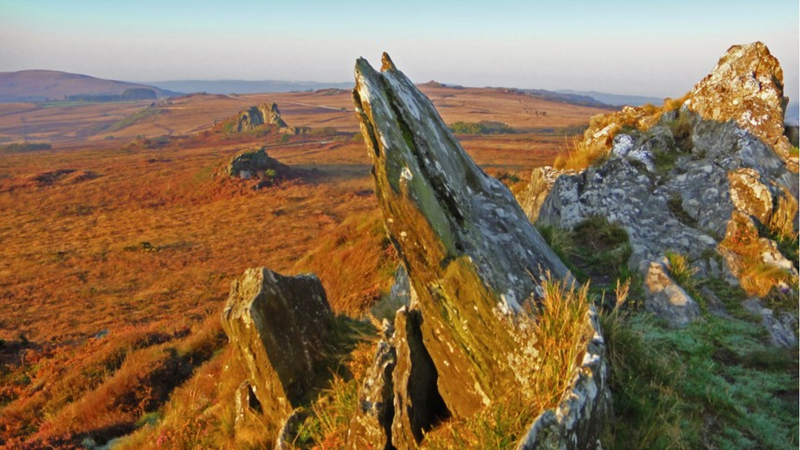 The Monts d’Arée, in the far western reaches of Brittany, are an elevated wilderness of bracken and heather running like a spine through central Finistère. It was here, in about 560, that the decisive battle that cost Conomor the Cursed his life is said to have been fought. The dispute here is a fundamental one. Nobody doubts that the Britons of this period sailed south to establish themselves in Brittany. Close connections were undoubtedly maintained across what we now know as the English Channel; a glance at the map [above right] shows a couple of examples of the fascinating and widespread duplication of place-names (Dumnonia/Dumnonia; Cornwall/Cornouaille) that exists between south-west England and the Breton peninsula. What is far less certain is whether the leaders who travelled to Brittany from the fourth century onwards left their lands in Britain behind – or whether there were rulers active and powerful enough to reign on both sides of the water. In attempting to tackle this problem, we need to point, first, to the reasons for British emigration in this period. Abandoned by the Rome, and then confronted by Anglo-Saxon migration in the years 450-550, the Celtic inhabitants of Britain fell back to the the west, where the land was higher, rougher and more inaccessible, and where much of the soil was so poor that the invaders had little motive to press for further conquests. In consequence, British kingdoms continued to exist to the north (in Strathclyde, with its capital at Dumbarton – which means “the fortress of the Britons” – c.450-c.1030); in Wales; and to the south, in Devon and Cornwall, where the state known as Dumnonia was certainly in existence well before 550 and survived as late as about 839. Britain at the time of Conomor, showing British polities in black and Saxon ones in red. 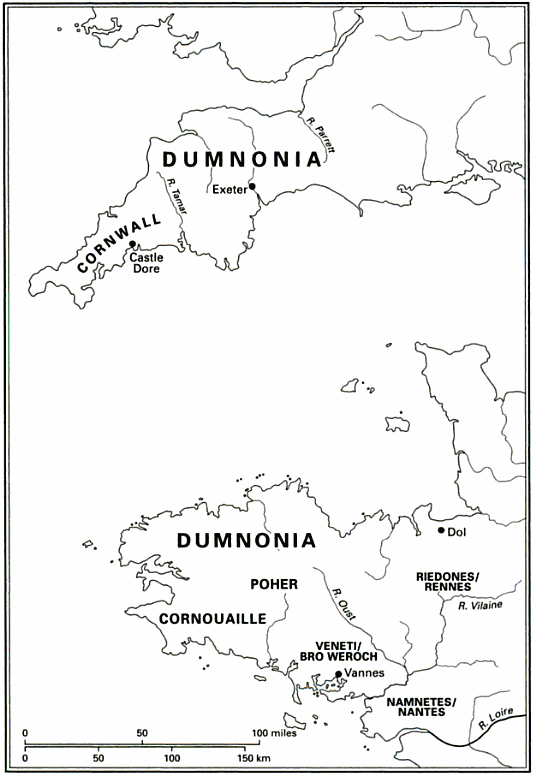 The British states include Dumnonia (Cornwall and Devon); Strathclyde is here shown as “Damnonia.” Image: Wikicommons. Click to show in higher resolution. But if a key factor in the existence of these states was geography, the same features that allowed the Celts to retain their independence also caused them serious difficulties. There was little decent land available in the highlands, and Celtic law prescribed the division of each father’s possessions among all his sons. In such circumstances, the progressive dividing up of patrimonies inevitably produced poverty and encouraged the Britons of both Cornwall and South Wales to look hungrily over the Channel for land. It is generally supposed that this emigration began no later than 350, and we know there was enough of it for a “bishop of the Britons” to have travelled from Brittany to attend the Council of Tours, which was held in 461, and for the Brythonic and Breton languages to remain indistinguishable as late as the 10th century. Small states controlled by rulers with British names existed in the Breton peninsula after 500, and in the course of the sixth century enough Britons emigrated to France, with sufficient success, for a clearly independent collection of Breton polities, with their own language and distinct identity, to have emerged a century later. All this certainly suggests something much more interesting than the emigration of some scattered families, but it is not enough to prove that the Britons who sailed south were politically significant or that they retained lands and power in their homeland. There are, indeed, reasons to suppose that this was not the case; educated guesswork suggests that British control in Brittany was far stronger in the countryside than in its towns, where Roman and Frankish influences still predominated in this period. That, and the fact that no identifiable British “high king” emerged south of the Channel in the sixth century, argue against the existence of a ruler powerful enough to control significant territory in both Cornwall and Brittany. Even Conomor the Cursed, remember, was only a count, and ruled no more than the northern shores of the peninsula. This reasoning cleaves to the line of least resistance, and eminent authorities on the period, among them Wendy Davies, follow it. Yet there is other evidence. 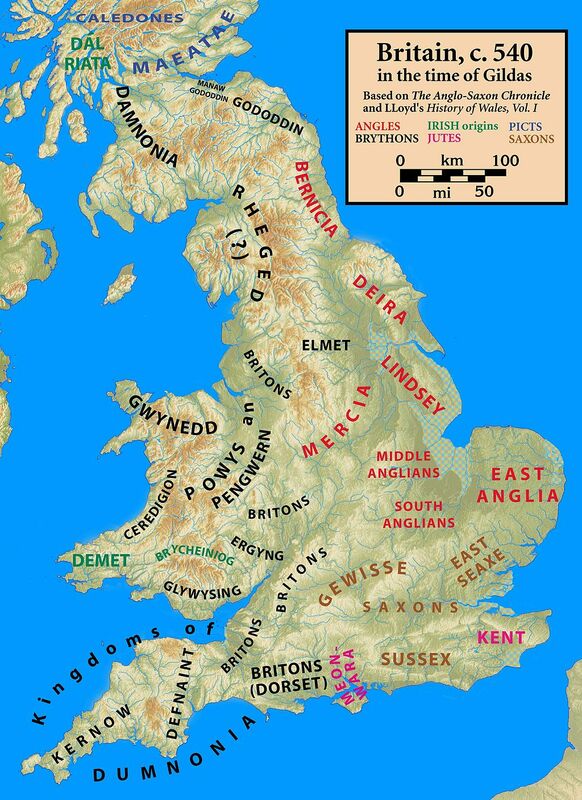 Dumnonia was easily the biggest of the British kingdoms that survived the westward push of the Saxons – at its height it was something like 125 miles (200km) from end to end, making it among the largest states, by area, in all of Britain at this time. That suggests rulers of some prominence, and a degree of organisation that might have been sufficient to permit projections of their power. Conomor’s name – “Hound of the Sea” – and the powerful traditions of the Breton saints’ lives, which present him as an “unjust and unprincipled stranger” – an outsider, in other words – both suggest a possible origin in Dumnonia as well. 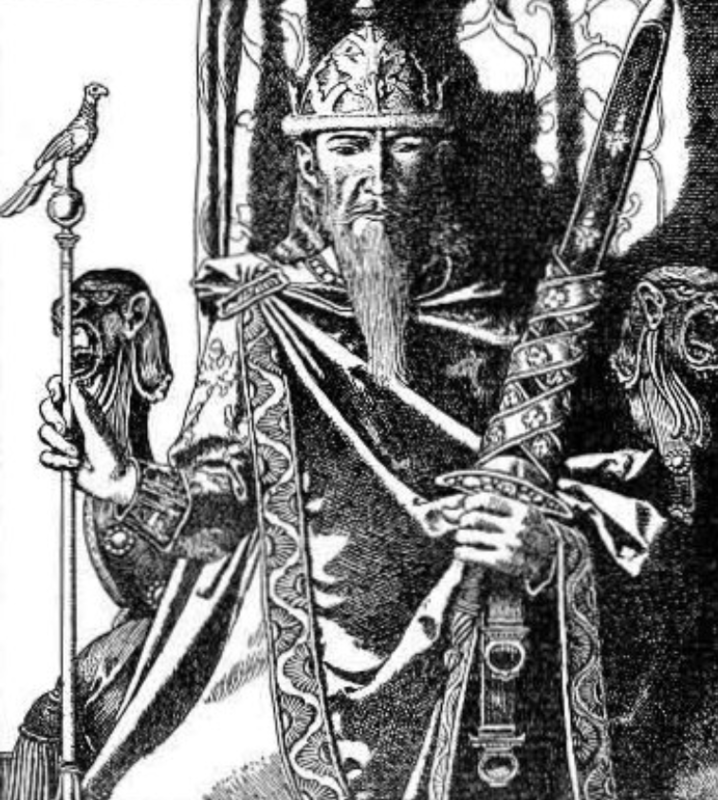 King Mark of Cornwall – the hypothetical ruler of a trans-Channel Celtic state, and an important figure in the Arthurian tradition. Illustration by Howard Pyle, 1905. The most interesting fragment of evidence, though, comes from the Life of St Paul Aurelian – a much later source, remember, completed in 884, and thus one that must be treated with great caution. This mentions a “King Marcus whom by another name they call Quonomorius” – and this extract has been taken as a reference to the semi-legendary King Mark of Cornwall who figures prominently in medieval Arthurian romance and plays an especially important part in the story of Tristan and Yseult (that is, Tristan and Isolde ). In this romance, Mark is a king of Cornwall – Dumnonia – and Tristan is his nephew, sent to Ireland to bring back Mark’s beautiful young bride, who instead, inevitably, falls in love with the girl himself. Now, it is true that the King Mark of Arthurian romance makes his first appearance in literature at least 500 years after the historical King Mark lived and ruled – if indeed he ever lived at all. And it’s also true that no source dating to before St Paul Aurelian makes mention of a Mark of Cornwall. So we are sailing here in very dangerous waters. But a connection can still perhaps be made, for a late Welsh list of the Dumnonian kings – held at Jesus College, Oxford (MS.20), though probably copied no earlier than the late 14th century – includes a “Kynwawr” who would have reigned shortly before 550. From an etymological perspective, Kynwawr can be identified with both Cynfawr (a name known to have existed in 6th century Wales), and the Latin Conomorus. Thus, if credence can be placed in the king list, a king called something very like Conomor ruled in Dumnonia at pretty much the same time as a Count Conomor ruled in Brittany; and if credence can be placed in the Life of St Paul Aurelian, this Conomor might also be the same person as the King Mark of Cornwall whose name remains indelibly associated with Arthurian romance. And if both these things are true, then the Conomor who features as the Bluebeard of Breton legend might indeed have been a British king of considerable power and resources, whose domains included lands on both sides of the Channel. 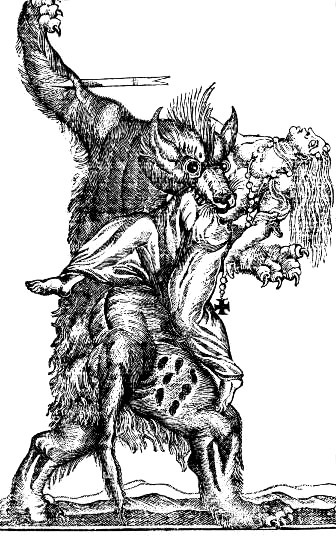 A French werewolf, from an engraving of the 18th century. There is at best only an outside chance that this extensive chain of surmise stands much scrutiny, and the association of King Mark with Kynwawr of Dumnonia has proved to be, by itself, enough of a lure to have generated some highly dubious scholarship, which has come to muddy the waters of even quite respectable historical journals – as the afterword to this essay seeks to demonstrate. Things can only get more tangled and less rigorous if we attempt to add Breton werewolves and wife-killers to the mix. The idea remains, though, an enticing one. And a Conomor who had his roots in Wales or Cornwall remains the best candidate by far for the cursed count who haunted medieval Brittany, and caused even the peasants of the 19th century to mutter prayers whenever they heard his name. Anyone searching for the historical Conomor online will soon encounter references to an ancient monument in Cornwall which not only seems to refer to him, and provide additional evidence for the existence of a powerful British ruler who controlled territories on both sides of the Channel during the sixth century, but which has also been linked directly to the tale of Tristan and Yseult. It has been claimed that this “Tristan Stone” is proof that these two legendary characters were real historical personages, and that Tristan was the son of a King Mark, who was also known as Conomor, and who ruled from an important hill-fort, Castle Dore, which can still be seen a mile or two to the north of the spot where the monument now stands. 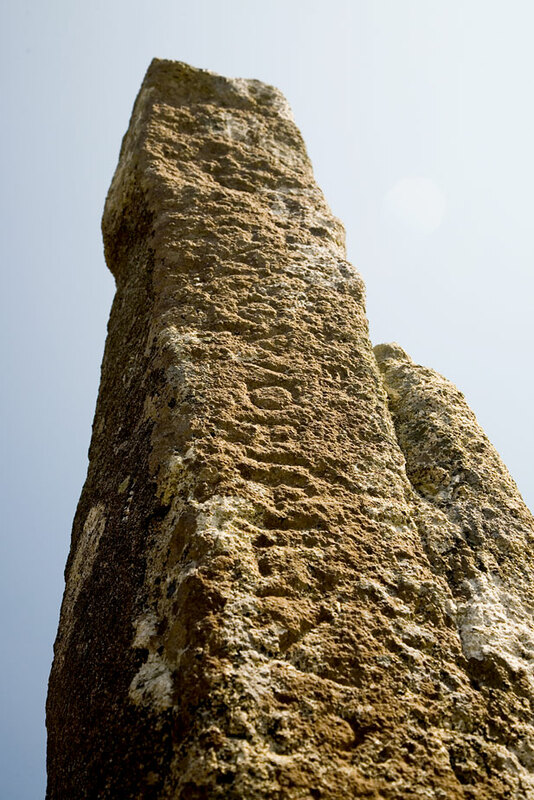 The “Tristan Stone”, with its badly worn inscription – a sixth century granite monument outside Fowey in Cornwall. We’ll return to this interpretation in a moment. But let’s look first at what we know about the stone, its location and its history. What follows, I should note, is drawn from the major academic studies of such stones – those of Macalister and Okasha. I’ll deal with the rival, more ambitious claims of the archaeologist Raleigh Radford and the Arthurian scholar André de Mandach later. 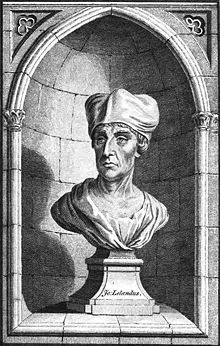 Henry VIII’s antiquary, John Leland – the first man to note the existence of the ancient Cornish stone that mentions a “Conomorus”. The second thing to point out is that the stone has moved – and, apparently, fragmented – in the time since Leland implied he saw it. If it was one mile from Castle Dore in 1540, then it was a full two and a half from Fowey, and Okasha summarises its subsequent movements as follows: it was relocated, probably before 1602, to a spot about a mile and a half away, on the roadside one mile from Fowey; by 1742 it had been dumped in a ditch along the Castledore road near Newton, where it was soon “half-buried” in accumulated muck; it was set upright once more about 1803, at the same spot; it was moved again, shortly before 1894, to “the centre of the highway outside Menabilly Lodge gates”; and in 1971 it was shifted yet again, slightly to the south, and re-erected at the place where it can now be found. This is a history that combines periods of rough care with longer stretches of utter lack of care, and it is not very surprising that the inscription on the stone has become far less readable than it was when Leland apparently saw it. The wording itself is now in two lines, reading downwards and facing left. (Leland’s interpretation may imply there were once three.) It is in Latin, in capital script, and – thanks to its murky, deteriorated condition – it has been read rather differently by the various people who have seen it. The versions that have been published along the way include those of William Camden, in his Britannia of 1586; of the Welsh antiquary Edward Lhwyd (a friend of Isaac Newton’s who was Keeper of the Ashmolean Museum at the University of Oxford and a noted student of the Cornish language), in a private letter of 1700; of the Cornishman William Borlase, in his Antiquities of Cornwall, 1754; and of Daniel and Samuel Lysons, in the third volume of their Magna Britannia, 1814. The “Tristan Stone” in its current position, by a roadside outside Fowey. It has stood there only since 1971. I make no claim to any expertise in the interpretation of ancient stone inscriptions, but a couple of things seem readily apparent here. The first is that increasing wear on the inscription (and very likely also increasing scrupulousness on the part of its interpreters) caused some individual letters on the monument to be become – or be acknowledged as – illegible between the eighteenth and the twentieth centuries. The second is that there is a very dramatic difference between the inscription as given by Leland in 1542, and the inscription reported by every other witness, beginning with Camden four decades or so later. These distinctions become important when we turn to the work of André de Mandach, a Swiss scholar of Arthurian legend who is the most important reinterpreter of the inscription. Although it seems to have been John Rhys, the inaugural Professor of Celtic at Oxford, who first proposed (in 1875) that the stone was erected in memory of a “Drustagni,” and it was certainly Raleigh Radford (in the 1930s) who argued that it commemorates the Tristan of medieval romance, it was de Mandach who did most to tie all this together. His work places great stress on the primacy of Leland’s version of the inscription, and uses it to tie it to the Tristan legend by arguing that Clvsilla = Clu-silla = “blonde flower” [ancient Irish] = Isolde. De Mandach goes on to propose that Leland encountered the stone when it was not only significantly more legible, but also significantly more complete, than it was found by any modern visitor. He points out, by comparing sketches, that it seems to have been then about 25 inches (63cm) wide, whereas the monument we see today is only 13 inches (33cm) across. There is certainly something in this argument; we have a sketch [below right], published by Borlase midway through the eighteenth century, which shows the monument – known in those days merely as the Long-Stone – in something more nearly approaching its original shape. The reason for its deterioration, by the way, is probably that the original stone was adapted to be surmounted by some sort of cross; this became detached at some point before Leland’s visit to it, exposing a mortise in the top of the remnant. This hole allowed water to collect and begin a slow process of degradation via successive freezings and thawings. Borlase’s engraving of the Long Stone as it was c.1750. Note its width – much greater than that of the surviving monument today. Cutting what is threatening to become a lengthy story as short as possible, de Mandach’s argument is that a third line, originally part of the inscription, was lost as a result of this shrinkage; he proposes that Leland reported the second and third lines of an original three-line inscription, while every person who came after him transcribed only the first and second lines. This dichotomy, he argues, can be resolved by supposing that the third line was lost to the process of “shrinkage” after Leland saw it. Yet there are good reasons for supposing that this cannot be so, and in fact de Mandach’s own evidence does not support his argument. He prints Borlase’s engraving, which depicts the monument at its full width, and clearly shows only a blank space where Leland’s third line ought to be; if we assume the old antiquary’s reading was correct, then his CVM DOMINA CLVSILLA must therefore have been lost to erosion, not to the gradual degradation of the stone itself. But – given that Borlase wrote well before the stone spent decades lying in a ditch, while Okasha points out that the second line of text is better preserved than the first – there seems no obvious reason why a third line should disappear completely, while the one above it remained entirely legible. 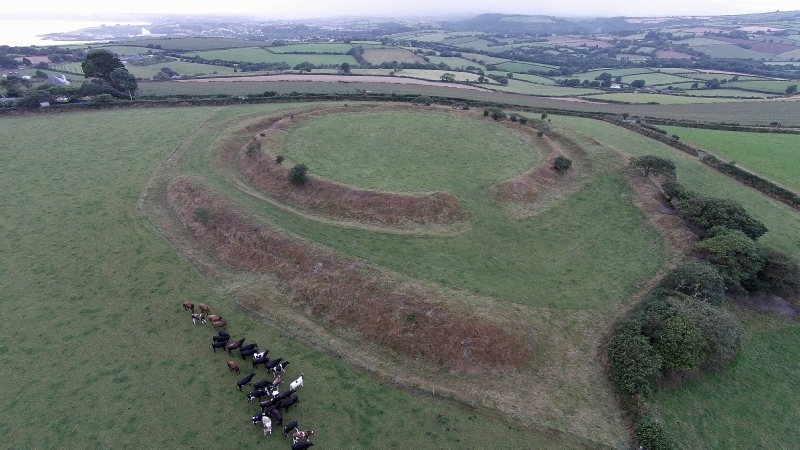 The hill fort at Castle Dore, near Fowey. It dates to the Iron Age but remained in use at least as late as the Roman occupation. We’re left with a monument that seems to date to about our period, which must have been produced by a family possessed of considerable resources, which was set up near an important castle, and which commemorates the son of a “Conomor” – albeit one who was almost certainly not named “Tristan”. It’s not implausible that the Conomor in question was the same man as the Breton Bluebeard, nor utterly impossible that he was the King Marcus/Quonomorius of the Life of St Paul Aurelian. But, equally, there is no proof at all that he was either of these things. For all we know, “Conomor” was a common name at this time, given to many members of many noble families. The Long-Stone thus adds little to our quest for an historical Conomor the Cursed, raising more questions than it answers. Gustave Doré’s engraving “Barbe-bleu” (1862) for a French edition of Perrault. What all this shows, I would contend, is the great danger of wanting something to be so. Both Raleigh Radford and André de Mandach seem to have been guilty of this sin. Radford wanted to find evidence that a significant British civilisation had survived the departure of the Romans; excavating at Castle Dore, a few miles north of where the “Tristan Stone” stands, he uncovered some post-holes and a couple of fragments of old pottery, and dated them to the years after Rome’s withdrawl – “proving” (and not just in his own mind, for his findings were not challenged for nearly 40 years) that Castle Dore had been the palace of King Mark of Cornwall, and the likely capital of a substantial Dumnonian government. Both Radford and de Mandach also badly wanted to demonstrate that the Arthurian legends had historical roots in the same time and place. This need led them into convoluted arguments, and most dangerously it prompted them to reinterpret evidence in ways that suited their own carefully prepared cases. It was for this reason that both men were willing to interpret the hazily-carved, badly worn first letters, CI, on the Fowey monument as a single letter “D,” improbably inscribed in quite a different script to that which followed – a peculiarity that would make the stone utterly unique among all the early Christian memorial stones that have survived in England, Wales and Ireland.. It was this bit of palaeographical contortionism that allowed them to read the inscription not as a reference to “Cirusius” but as “Drustanus” – Tristan – and turn the Long-Stone into the “Tristan Stone” that pops up on the internet today. It is romantic. But it is scarcely history. Albert le Grand. 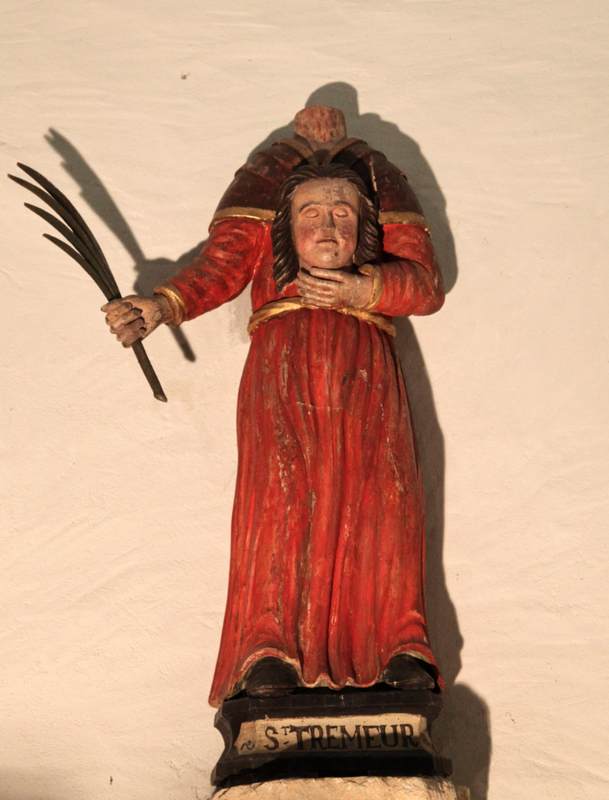 Les Vies des Saints de la Bretagne-Amorique. Brest: P. Anner et Fils, 1837; Bernard S. Bachrach. A History of the Alans in the West. Minneapolis: University of Minnesota Press, 1973; Brigitte Cazelles and Brett Wells. “Arthur as Barbe-Bleu: the Martyrdom of Saint Tryphine.” In Sahar Amer and Noah D. Gunn (eds), Rereading Allegory: Essays in Memory of Daniel Poirion. New Haven: Yale University Press, 1999; Celtic Inscribed Stones Project database, compiled by the Department of History and Institute of Archaeology, University College London, accessed 28 December 2015; TM Charles-Edwards. Wales and the Britons, 350-1064. Oxford: Oxford University Press, 2013; Wendy Davies. “The Celtic Kingdoms.” In Paul Fouracre (ed). The New Cambridge Medieval History I, c.500-c.700. Cambridge: Cambridge University Press, 2005; Sidney Hartland. “The forbidden chamber.” The Folklore Journal 3 (1885); Casie Hermansson. Bluebeard: A Reader’s Guide to the English Tradition. Jackson [MS]: University of Mississippi Press, 2009; Historic England. “The Tristan Stone, early Christian memorial stone and wayside cross, 75m north of Polscoe,” 8 December 1997. Accessed 27 December 2015; “Mr Canon Kendall to Mr Moyle,” 1717/18, in The Gentleman’s Magazine May 1838; Gy Kroó. “Duke Bluebeard’s Castle.” In Studia Musicologica Academiae Scientiarum Hungaricae 1 (1961); Marianne Micros. “Robber bridegrooms and devoured brides.” In Mary Ellen Lamb and Karen Bamford (eds), Oral Traditions and Gender in Early Modern Literary Texts. Aldershot: Ashgate, 2008; R.A.S. Macalister. Corpus Inscriptionum Insularum Celticarum vol.1. Blackrock, Eire: Four Courts Press, nd (c.1996); André de Mandach. “The shrinking tombstone of Tristan and Isolt.” Journal of Medieval History 4 (1978); Elsie Masson. Folk Tales of Brittany. Philadelphia: Macrae Smith, 1929; Elisabeth Okasha. Corpus of Early Christian Inscribed Stones of South-West Britain. Leicester: Leicester University Press, 1993; Susan M. Pearce. “The traditions of the royal king-list of Dumnonia.” Transactions of the Honourable Society of Cymmrodorion 1971 Part 1 (1972). Susan M. Pearce. The Kingdom of Dumnonia: Studies in History and Tradition in South Western Britain, AD 350-1150. Padstow: Lodenek Press, 1978; Charles Perrault. “Blue Beard.” From Tales of Mother Goose. Accessed 27 June 2015; Philip Rahtz. “Castle Dore – a reappraisal of the post-Roman structures.” Cornish Archaeology 10 (1971); John Rhys. “Some of our inscribed stones.” Archaeologia Cambrensis. 4S. VI (1875); Christopher A. Snyder. The Britons. Malden [MA]: John Wiley, 2003; Lewis Spence. Legends and Romances of Brittany. London: George Harrap, 1917; Adam P. Spring and Caradoc Peters. “Developing a low cost 3D imaging solution for inscribed stone surface analysis.” Journal of Archaeological Sciences 52 (2014); Clare Stancliffe. “Christianity among the Britons, Dalriadan Irish and Picts.” In Paul Fouracre (ed). The New Cambridge Medieval History I, c.500-c.700. Cambridge: Cambridge University Press, 2005; Maria Tatar. Secrets Beyond the Door: the Story of Bluebeard. Princeton: Princeton University Press, 2006; Charles Thomas. And Shall These Mute Stones Speak? Post-Roman Inscriptions in Western Britain. Cardiff: University of Wales Press, 1994; Lucy Toulmin Smith [ed.] The Itinerary of John Leland in or about the Years 1535-1543, parts I to III. London: George Bell and Sons, 1907; Ernest Alfred Vizetelly. Bluebeard: An Account of Comorre the Cursed and Gilles de Rais, with Summaries of Various Tales and Traditions. London: Chatto & Windus, 1902; Marina Warner. From the Beast to the Blonde: On Fairy Tales and Their Tellers. New York: Vintage, 1995; Micheline Walker. “Bluebeard: motifs & suspense.” Micheline’s blog, accessed 9 June 2015. Search keys: Cunmar the Cursed, Cunmar the Accursed, Conomor the Accursed, Comorre the Accursed. Whoever the real Bluebeard may have been I can’t think why anyone would want to enter that room – the stench of those decomposing corpses, even just through the keyhole, should have been seriously discouraging. I wonder… have there been any studies or solid research on how ‘durable’ these chains of oral history are? It boggles the mind to think that a warlord could still be remembered in folkloric form nearly fifteen hundred years later, yet presumably there’s a reason people take this kind of thing seriously. Also, happy new year Mr. Dash! Personally I find these latter examples hard to credit.But, anyway, a happy new year to you and all my readers! A wonderful article on one of my childhood “fairy” tale ! So much explanation, I’m amazed. He sounds just like me, then. Mine is black though, with grey hairs. Also, all of my previous wives died of natural causes, I swear! You cannot prove anything!!! I was wondering if anybody else would raise this point, but nobody has, so I might as well. Count Conomor the Cursed (who really ought to be a baddie in Doctor Strange’s comic if he isn’t already – or maybe he could fight Hellboy? ), apart from some generic Evil Count shenanigans like setting his dogs on peasants for fun, murdered five wives. So basically he was a marginally worse husband than Henry VIII. That isn’t exactly nice, but they didn’t call ’em the Dark Ages for nothing; there must gave been plenty of other petty tyrants in roughly the same time and place who were just as bad, and probably far worse. So why was it this chap alone who was remembered as such an exemplar of ultimate subhuman evil that well over a thousand years later, people were still scared of a monster so vile that Hell spat him out in disgust and he came back from the dead as an immortal man-eating werewolf? I’m reminded of Richard III, who, until his recent unexpected rehabilitation, had a similar reputation for being the ultimate bad guy, based almost entirely on the fact that his two nephews died under very suspicious circumstances that happened to be a bit too convenient from his point of view. Again, not exactly nice, but kings (and queens) have done far worse. However, rival claimant Henry Tudor, who did some very similar things himself, had a far better PR department than Richard, and managed to stir up popular feeling against him by focusing attention on that One Bad Thing he did to the exclusion of all else, until Richard ended up losing the war, the crown, and his life (exactly the same thing happened to Boris Godunov). And since the Plantagenets had a far better claim to the throne than the Tudors, Henry’s heirs carried on exaggerating Richard’s villainy for the next few generations just to be on the safe side. Of course, it doesn’t hurt to have your propaganda written by William Shakespeare. Here’s another thing. “Conomor” means something a lot like “sea-wolf”. That sounds less like a given name than a nickname he picked up later in life as a result of successful and probably rather bloody naval exploits. So let’s surmise that King Mark of Dumnonia was the legitimate heir to a small kingdom round about Devon or Cornwall. As an ambitious young man seeking to establish a tinpot empire, he launched an audacious cross-channel invasion, grabbing the territory of a Breton count and gaining the nickname of “hound from the sea” along with a reputation for ferocity. So on one side of the channel he was the rightful king and perhaps even popular, but in the other, he was a foreign usurper. King Mark is remembered almost entirely because he arranged to marry a much younger woman in order to create an alliance with Ireland, thus bringing lasting peace to his kingdom, but alas, she not altogether surprisingly preferred his nephew to him. In the older, less “Arthurian” versions of the tale, Mark is a good king with an unfaithful wife, so it was all her fault, and by the standards of the time, he was perfectly justified in condemning the adulterous pair to death. In the oldest extant version they’re forgiven at the last minute in what seems a bit like a hastily tacked on happy ending, but in all likelihood, if the story is based on fact, Mark had them both killed, and nobody thought him unreasonable for doing so. One interesting detail is that Mark supposedly confined Iseult in a leper colony prior to her scheduled execution. If this is an echo of historical fact, instead of being a pointless bit of sadistic degradation that seems to fit poorly with everything else Mark does, it makes perfect sense. Right up until the end of the Middle Ages, it wasn’t unusual for somebody holding a high-ranking prisoner they wanted to kill but didn’t quite dare to keep them in the unhealthiest prison available in the hope they’d catch something fatal so that nobody could say their death was murder. If Mark married Iseult to make a formerly hostile power his ally, killing her for any reason would be likely to have the opposite effect! So although he was not only legally entitled to execute his adulterous wife, but would have been expected to do so, and would have been thought of as weak and foolish if he hadn’t, he could well have attempted to arrange for her to drop dead of disease prior to his being forced to kill her as the best compromise in a very tricky situation. Let’s assume that Ireland wasn’t involved at all, and Mark’s new bride is the daughter of a Breton kinglet. And since everyone calls him “The Hound From The Sea” over the water, French Mark shall henceforth be referred to as Conomor. As an invader with no legitimate claim to any part of France and no reliable allies in those parts, this would be an excellent piece of diplomacy, both for him and for his heirs, who would henceforth have a perfectly valid claim on the French fiefdom he already holds, plus another one. It’s reasonable to assume that Conomor wouldn’t marry anyone not of ideal child-bearing age, and since he was old enough to lead an army over 20 years ago, he is at least middle-aged, and by the standards of the time old – certainly at least twice her age. He must also be single, which, since kings, even if they don’t really like girls all that much, usually want heirs, means that by his age he has at least one deceased wife, possibly several. Lots of people died young in those days – no big deal. The oldest version of the legend implicitly tells us that although Conomor murdered five wives, nobody found the first four deaths suspicious. It was only his last wife who people wondered about because her servants revealed the truth to her father, which in some muddled way led to Conomor’s downfall. It would also appear that, in an age before the invention of forensic science, the fact that he’s also murdered all his previous wives had to be revealed supernaturally. A plausible reconstruction of the actual events might go thus. Conomor marries for the aforementioned political reasons. He has been married four times before, but all his wives died quite soon after the marriage of natural causes, and perhaps his French subjects, who don’t like him over much, are already suggesting that God has cursed him by taking away all his brides before they give him an heir. His last wife is very young and pretty – a sort of Princess Di – and everyone feels sorry for the poor thing, who is probably very obviously not too thrilled with the situation. And then she dies. She has of course been having a fling with some young man, and Conomor was within his rights to have her killed. But that’s going to turn her father from a perhaps none too enthusiastic ally into an implacable enemy. So he covers it up. The girl dies of “natural causes”, perhaps after being confined in a pestilential prison for a while. Maybe she stubbornly refuses to become ill and has to quietly stabbed. As for her lover, he simply vanishes. It’s a all a bit vague, and rumours abound. Naturally they tend to be more favourable to the girl than her fierce old spouse. This is something Judwal can turn to his advantage! In the absence of a legal trial, or any formal admission that he was a cuckold, Conomor can be made out to be a black-hearted fiend who murdered his innocent young bride out of sheer depravity – maybe a local hermit who never liked Conomor has a convenient vision confirming that not only was she murdered, but so were all the others. Her father, now Conomor’s implacable enemy, is naturally in favour of any version of events which casts his daughter as an innocent martyr rather than a naughty minx who played around. Popular feeling is growing against Conomor, and a nobleman he considered powerful enough to worth allying himself with through marriage is now angry enough to risk providing military backing to Judwal. It all ends predictably badly for Conomor. Though it’s not quite the end. Judwal has neither the birthright to Mark’s English territories, nor the resources to attack them if he did. He just wanted his father’s old lands back again, and he’s happy to leave it at that. But since Conomor’s relatives across the water may not see it that way, it might be advisable to keep up the anti-Conomor propaganda for a good few years after the event, so that everyone knows they have to fight tooth and nail to repel any reprisals by those dreaded Cornishmen whom Judwal undoubtedly referred to at the time as “cream-eating invasion werewolves”. Meanwhile, on his home turf, Mark’s loyal subjects got a sanitised but fairly accurate version of events: their king married a French princess for good reasons that didn’t happen to include love, the naughty girl was unfaithful to him, he had her killed as you do, and the French in general and her dad in particular didn’t like it. So long Good King Mark. Though apparently his next of kin didn’t consider all this enough of a tragedy that they felt obliged to re-invade bits of France that were now a lot more prepared for such a thing than they had been when Mark pulled it off, so Judwal’s version of events became the official Breton version forever. The End. What do you think? Thank you for such a thought-provoking comment. While there is, of course, no firm evidence ether way, I would say that there is nothing inherently impossible about the scenario that you sketch out. And it neatly ties together the dangling strands of history and myth that have come down to us. Thanks for the thanks – it’s nice to be appreciated! By the way, if you’re looking for more stories of this nature, have you ever checked out Hermitage Castle in the Scottish Borders? You get two satanically wicked noblemen for the price of one (I assume the legend must have bifurcated at some point), some interesting crossovers with Macbeth, and the murderous ghost of a seven-foot-tall half-fairy that I have good reason to believe is still taken very seriously indeed by some of the older locals, who attribute at least one death within living memory to the vengeful spook, and absolutely will not go anywhere near a certain spot after dark. Also, vampire dwarves from Hell, headless horsemen, and so many other ghosts that I think I’m right in saying Hermitage Castle is officially the most haunted building in the world other than Glamis Castle. Interested? Tristan and Isolde are not really historical characters; they are literary ones, the product of hundreds of years of storytelling. If you’re interested in the characters and how they evolved and how their stories were told, there are several good academic resources that go well beyond the opera. You could look at Phillipa Hardman’s The Growth of the Tristan and Iseut legend in Wales, England, France, and Germany – or, for a collection of more specialist studies, Joan Tasker Grimbert’s Tristan and Isolde: A Casebook. If what you are looking for is a retelling of the story of Tristan and Isolde then there are, again, many options, but Rosemary Sutcliff’s Tristan and Iseult, while nominally aimed at children, is as straightforward and as powerful as any.